T.O.M. 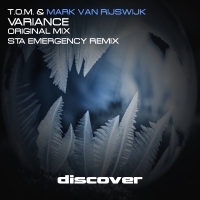 and Mark van Rijswijk are next up on the main Discover imprint with Variance. Main room trance with a strong old school progressive trance influence is the order of the day here as the original mix builds with warm melodies and strong grooves. The STA Emergency remix is one for the purists with big chords and strong use of the existing melodies that compliment the original with style! 'Variance' is available now from Beatport and iTunes.